Hello Everyone! It's Wednesday at that means it's time for another challenge at The Perfect Sentiment. Our challenge this week is to create a birthday card (with sentiment on the front) using the embossing resist technique. When Sami first suggested this technique for our challenge I have to admit I cringed. I haven't done embossing resist in years and if I could recall correctly I wasn't that great at it. But, that's why it's called a challenge, right? So, in the spirit of having fun I agreed and you're about to see my final results. 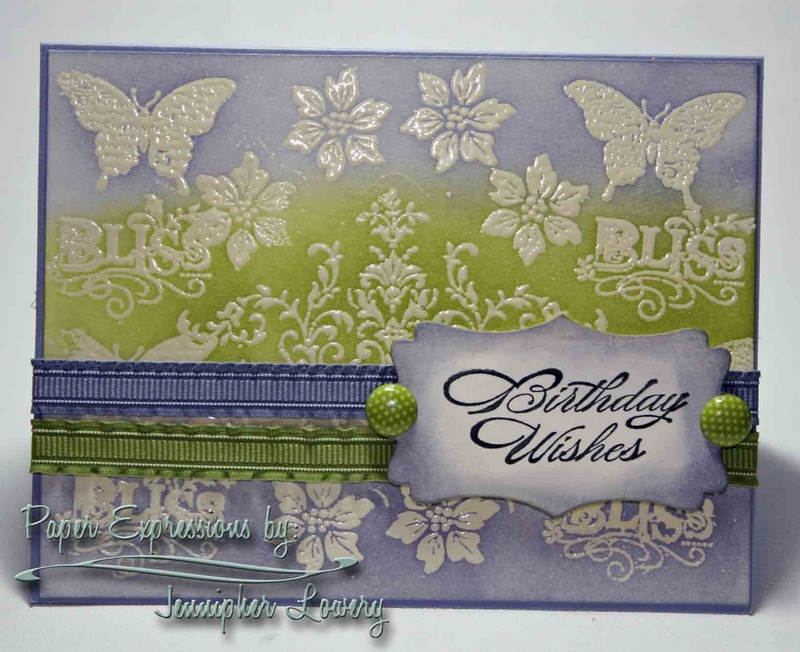 I created a card base using Wisteria Wonder CS. Then I cut out a layer of Very Vanilla CS and using the Bliss stamp set I stamped various images using the VersaMark watermark ink. 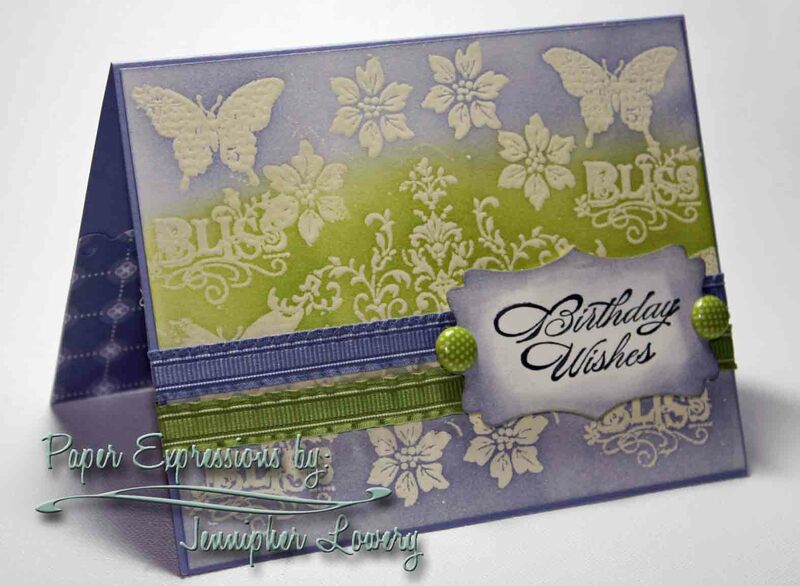 I covered the stamped images in clear embossing powder and then embossed with my heat gun. 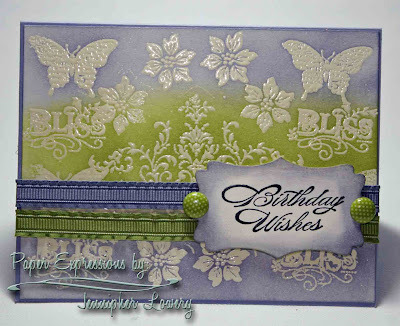 Using Wisteria Wonder and Lucky Limeade inks I sponged over the clear embossed images to make them pop. I was actually very pleased with this "homemade" patterned paper I had created and in the process of trying out an old technique I found a color combination that I really like. I added two strips of ribbon and for finishing touches I cut out a Spellbinders Grommet Tag and inked the edges of it after I stamped "birthday wishes" on it. So, all that cringing was for nothing! Once you're inspired come play along at the Perfect Sentiment! I'm in love, Jenn - gorgeous! Jennipher, this is stunning !! Love the colors and the technique. Your card is stunning, and purple and green is my favorite color combination! The design looks amazing and really packs a punch for one fabulous & festive birthday card! NJ! This is just beautiful, Jennipher! Love those colours and the gorgeous design you made. This is beautiful...you should emboss again! Very striking card! Thank you for commenting on my blog today...I do appreciate it! Blessings! wow great card jen love it. Very pretty and I agree, beautiful color combo! ohhhhhh! this is STUNNINGGGGG! I ♥ the layers of colors too..definetly will NEED to case this one!! This creation is gorgeous!!! I love the colors and images you used, absolutely darling!! This is one of my favorite techniques! Love how you made the color transitions so smooth. Jenn...this card is just gorgeous and just happens to be my favorite color...love it! I like how you used different inks..just beautiful. Adorable card! Great work on the butterfly and flowers. I love the colors too! Perfect use of this technique. A beautiful card! Very pretty! One of my favorite techniques. Your embossing is gorgeous. Beautiful card. Jennipher, your card is so beautiful. I just love the colors. Absolutely gorgeous card! I love that technique and your beautiful colors!! i love the color selection. the colors are soft and pleasing to the eyes. great job!